Black Diamond Sterling Silver Bridal Set : LOVE2HAVE in the UK! This black diamond sterling silver bridal set consists of a polished sterling silver wedding ring and a sterling silver engagement that you can purchase all in one go. These two rings are featured separately on our website, but we have specially matched them up for you to save you both time and money when bought together. This bridal set comprises of two sterling silver rings, being a plain sterling silver wedding ring measuring 6mm in width and a sterling silver engagement ring measuring approximately 4mm. 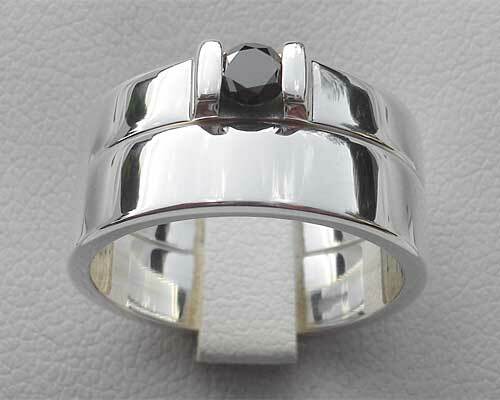 The 3mm stone is a lovely black diamond and is housed within twin raised ridges making a very contemporary styling for women looking for a silver wedding and engagement set with designer looks but at a reasonable cost. We have the polished version featured here, but the bridal set can come in a matte finish also if you prefer. 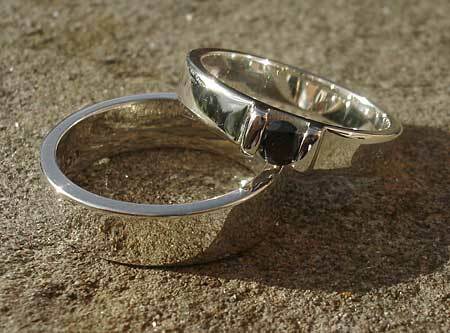 We can also do the plain wedding ring as a single matching mens sterling silver wedding ring to compliment the ladies set, together with a thinner width wedding band for her, rather than the 6mm listed as featured here. Just email us for further details. At Love2Have we can accommodate any width requirement for your wedding ring. Precious stone(s) Available: 1 x 3mm black diamond. Returns Policy: This UK made sterling silver bridal set is made to order so, therefore, non-returnable unless faulty or not as described. Please see our terms and conditions.